Home » News and Stuff » Uncategorized » The Chocopocalypse is Coming to the US!!!! 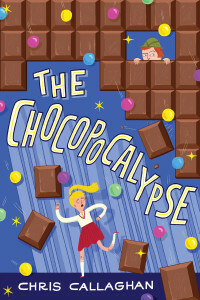 The Chocopocalypse is Coming to the US!!!! Delighted to be able to reveal the brilliant cover for the US version of ‘The Great Chocoplot’ – which is to be called ‘The Chocopocalypse’. It will be unleashed on an unsuspecting American public in the Fall of 2017. Huge thanks to Delacorte Press / Penguin Random House for spreading chocolate panic and to the incredibly talented Mary Kate McDevitt for creating the amazing art work.